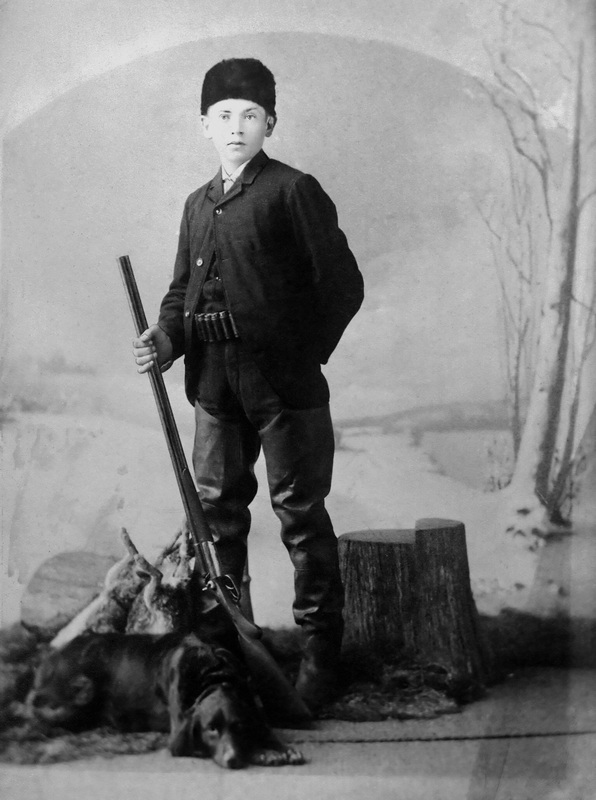 The more than century-old photo shows a stoic, proud young man wearing an ammunition belt and holding a shotgun in his right hand. At his feet lays a loyal hunting dog, seemingly tired from a day in the field. 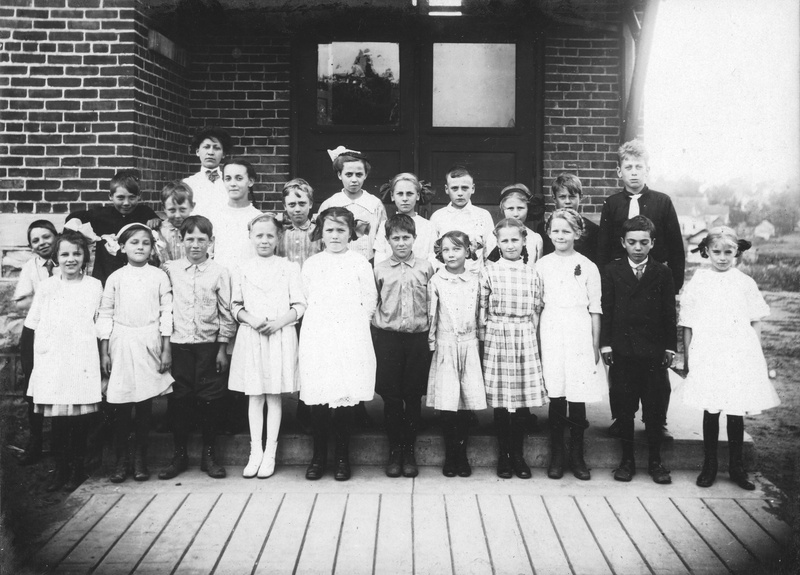 The young man is identified in the corner of the photo as Frank Hanneman, age 14. That dates the photo to 1909 or 1910. The paper-mounted and framed portait, in nearly perfect condition, survived all of these years in the possession of Carl F. Hanneman, Frank’s brother, and later in the collection of David D. Hanneman, Carl’s son. It is one of the oldest existing photos of a Hanneman from Wood County, Wisconsin. Frank Hanneman, 14, posed for this photo around 1910. What do we know about this young hunter? Frank Herman Albert Hanneman was born July 7, 1895 near Grand Rapids, Wisconsin, the son of Charles and Rosine Hanneman. In his early years the family lived and worked on the farm of his uncle, William Hanneman, in the Town of Grand Rapids in Wood County. The 1900 U.S. Census lists Charles Hanneman, 33, as a farm laborer on the farm of William Hanneman. By 1905 the Charles Hanneman family moved to Baker Street in Wisconsin Rapids when Charles got work at the Consolidated Water Power & Paper Co. The Hanneman boys enjoyed the great outdoors of central Wisconsin. We might assume by the photo, Frank enjoyed hunting birds. We have plenty of photos of a young Carl Hanneman fishing. On June 11, 1916, Frank married Irma Wilhelmine Louise Staffeld, and the couple took up residence on Baker Street in Wisconsin Rapids – a block away from his parents. The couple had five children between 1916 and 1929: Dorothy, Marjorie, Robert, Elizabeth and Joyce. Like his father, Frank had a long career working at Consolidated Water Power & Paper Co.
On July 14, 1947, Frank suffered a heart attack at home, and died shortly after arriving at Riverview Hospital. He was 52. His brother, Carl, was vacationing with his family in North Dakota, but returned for the funeral before rejoining the family vacation. 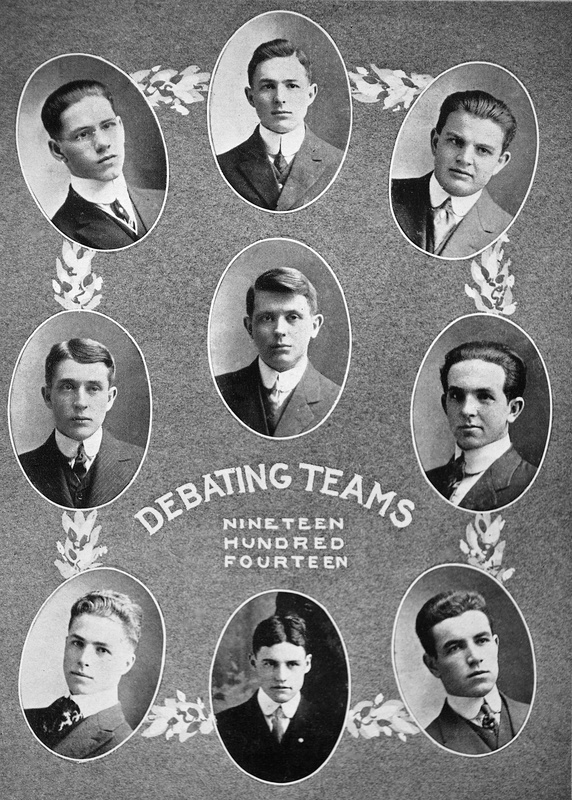 “The victory is not always with the strong.” Thus was the conclusion of the editors of the Ahdahwagam yearbook at Grand Rapids Lincoln High School, in recounting the 1914 performance of the school’s debate team versus nearby Marshfield. The debate team represented the best Lincoln High School had to offer. It was a basketball season for the ages at Grand Rapids Lincoln High School. 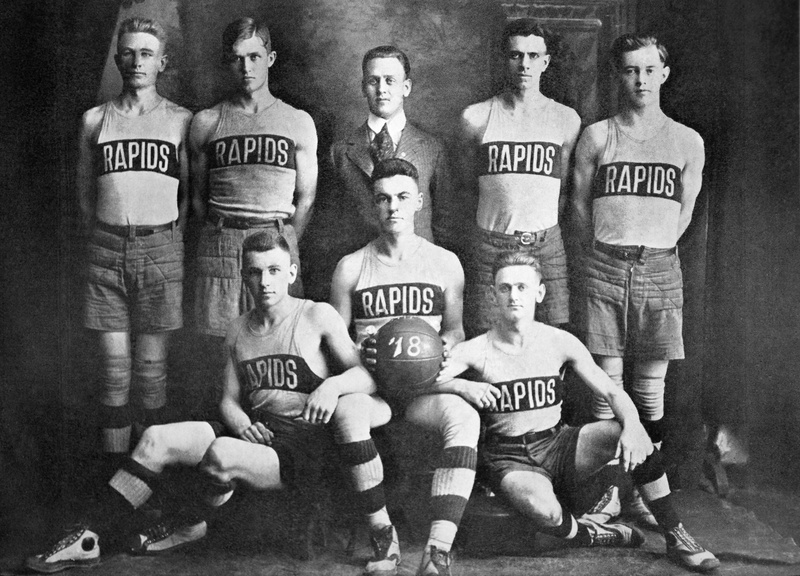 After a 14-1 season, the team stormed into the 14th annual Wisconsin state basketball tournament held March 20-22, 1918 at Lawrence College in Appleton. By defeating Columbus (32-25), Marinette (34-25) and Wausau (27-15), Grand Rapids secured its first Wisconsin state championship. Three Rapids players made the All-State team. Three members of the squad were named All-State after winning the championship. Stark was the team captain and scoring champion with 205 points. He was named a forward on the All-State team. The other All-State honorees were Plahmer (center) and Smith (guard). The only defeat of the season came at the hands of Nekoosa during sectionals play. The season high score was achieved January 18, 1918 with a 64-12 drubbing of Wautoma. A week later, that same Wautoma team nearly knocked off Rapids before falling 18-16. The irony of the 1917-1918 season is that the school year started with no basketball coach on the payroll at Lincoln High School. In short order, the services of Elmer J. Abrahamson were secured for the season. A 1915 graduate of Lawrence College, Abrahamson was a star college athlete in basketball, track and the pentathlon. Abrahamson only stayed for the championship season. He went on to a long teaching career in Oshkosh, Wisconsin. He died in 1978. The photograph is very poignant. A frail man, sitting in the afternoon sun on the front porch steps. He looks haggard and tired, maybe ill. This image is the last known photograph taken of Karl Frederick Christian Hanneman, who was known around Wisconsin Rapids as Charles or “Chas” Hanneman. The photo likely dates to 1931 or 1932, when he suffered from prostate cancer that eventually took his life. Charles Hanneman came to America in late November 1882 with his parents, Christian and Amanda Hanneman. He was just 15 when the family made its way from Stettin, Pomerania to Portage County, Wisconsin. Charles, his three brothers and two sisters settled on a 105-acre farm in the northwest corner of the Town of Grant, near the tiny hamlet of Kellner. 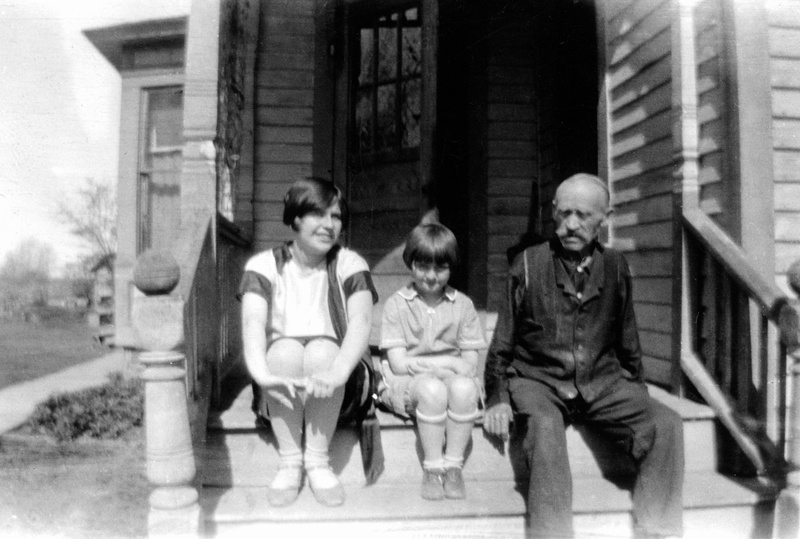 Nina and Elaine Treutel visit with Chas Hanneman, circa 1930. Charles worked on the Hanneman farm for a time. His brothers would stay in farming (maps from that period show many Hanneman farms in Portage County), but eventually Charles left farming and found work in one of the area’s many sawmills. At some point in his early 20s, Charles made the acquaintance of Rosine Ostermann, the eldest daughter of John and Mina Ostermann of the Town of Grand Rapids. They had many things in common. Both grew up on the family farm. 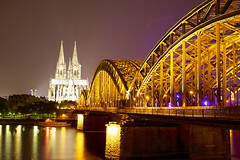 Rosie’s parents were from Germany (Saxony and Prussia), and his were from Pomerania. Rosie’s grandfather George Ostermann was one of the pioneers of Portage County, listed on the earliest tax roll of the Town of Grant in 1864. On April 2, 1891, Charles and Rosie were married at St. John’s Evangelical Lutheran Church in Kellner in a divine service performed by A.G. Grimm. 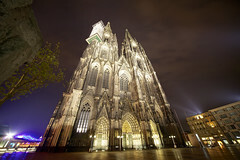 The witnesses were Charles’ father, Christian, and his brother, William. The bride’s attendants were her sister, Elsie Ostermann, and Emma Pribbernow. The groomsmen were cousins August Saeger and Herman Hanneman. The young couple came to know heartache early in their marriage. Their firstborn, referred in the records only as “C.H. Hanneman,” died in infancy in 1892. They went on to have four sons: Arthur John (1893), Frank Herman Albert (1895), Wilbert George (1899), and our own Carl Henry Frank (1901). Left to right: Christian Hanneman, Chas Hanneman, Carl Hanneman, David D. Hanneman. Work in the sawmill must have been erratic, or Charles left that occupation for a time. In 1900, U.S. Census records show the family living and working on the farm of Charles’ brother, William Hanneman. By 1905, Charles moved his family to the second ward in the city of Grand Rapids. He initially did manual labor for the city of Grand Rapids,possibly working on construction of the water and sewer works. The financial statements for the city in December 1907 show Charles worked 135 hours that month and earned 17.5 cents per hour for a paycheck of $23.63. By 1910 the family was living at 1774 Baker Street in Grand Rapids. The U.S. Census that year lists Charles as a laborer at a box factory. That may have referred to Consolidated Water, Power & Paper Co., where he later worked until his retirement, or the nearby Badger Box company. On March 31, 1918, tragedy struck the Hanneman home when Rosine died suddenly at age 48. Her death notice, which ran on page 1 of the Daily Leader, said she was fine during the day but fell ill and died at 11 p.m. We know that she had diabetes, and that may have contributed to her death. Carl was 16 when his mother died. Charles remarried in August 1919 and lived out his remaining years in his home at 1751 Baker Street. 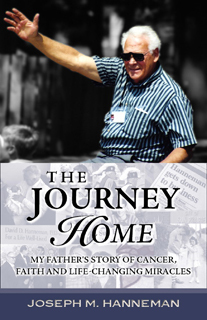 He became ill with prostate cancer in 1931 and was hospitalized numerous times in Wausau for surgery and treatments. He died at home on Oct. 11, 1932. He was 65. His death made front-page news in the Wisconsin Rapids Daily Tribune. Rosine Bertha Henrietta (Osterman) Hanneman (1870-1918), Frank Herman Albert Hanneman (1895-1947), Arthur James Hanneman (1893-1965), Carl Henry Frank Hanneman (1901-1982), Wilbert George Hanneman (1899-1987) and Carl Frederick Christian (Chas) Hanneman (1866-1932). Hand tinted photograph of Chas Hanneman, location unknown. “Karl Hanneman received instruction in the Word of God on 11 June 1916 in the First Moravian Church, Grand Rapids, Wis.” At the bottom of the certificate it reads: Gottes Furcht is aller Weisheit Anfang, which roughly means “All Wisdom Begins with Fear of God.” The document was signed by the Rev C.A. Meilicke. 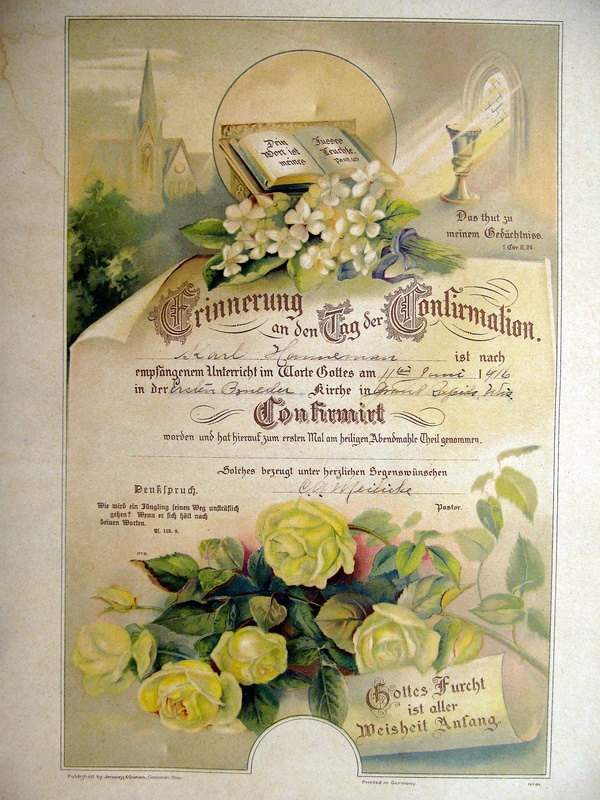 The confirmation certificate for Carl F. Hanneman from the First Moravian Church. We know Carl’s father, Charles Hanneman, was raised as a Lutheran, as were most of the Hannemans. The marriage certificate for Charles and Rosine Hanneman (nee: Ostermann) only says their wedding was a “Divine Service” and does not indicate a church. 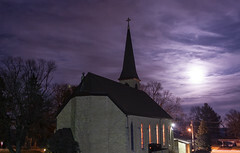 In 1907, Charles and Rosine and their four sons joined the First Moravian Church of Wisconsin Rapids, a congregation of some 450 people in a brick church on First Avenue South. The Moravian Church is one of the oldest Protestant denominations and traces its roots to the 1450s in Bohemia and Moravia. The area is now part of the modern day Czech Republic. 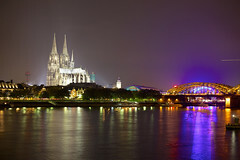 It is possible the family’s connection to the Moravian Church came from Rosine (Ostermann) Hanneman, whose father emigrated from Saxony in what is now eastern Germany. Carl and Ruby Hanneman were both converts to Catholicism, but we’ll save those stories for another entry.